West Brom have signed Liverpool and England striker Daniel Sturridge on loan for the rest of the season. The Baggies' Premier League rivals Newcastle and Serie A side Inter Milan were also keen on the 28-year-old. Sturridge has scored 74 Premier League goals in 114 starts and has also netted 27 times in cup competitions, but has started only five games this season. "This is a big coup for us. He has fantastic talent," said West Brom boss Alan Pardew. 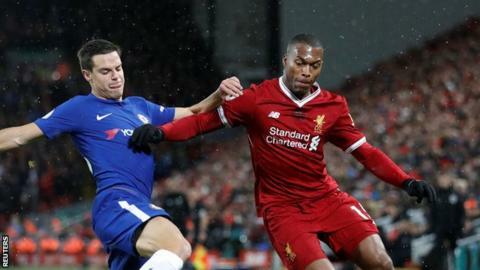 Birmingham-born Sturridge said: "I've got friends here I've played with before. The manager spoke very well, the challenge with the team and the style of play - I just felt this was the right fit for me." He will be eligible to play for West Brom in their FA Cup fifth-round tie at home to Southampton. Earlier on Monday, the Baggies signed Egypt defender Ali Gabr on loan from Zamalek until the end of the season.